> Shallots keep from harvest to harvest. After planting by hand very early in the year, the shallot forms new bulbs : up to a dozen bulbs grow around the original one and continue increasing in size until July. This is known as vegetative reproduction. 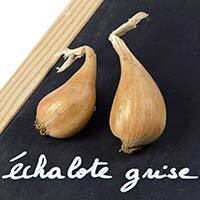 80 % of the shallots grown in France come from North Finistère. 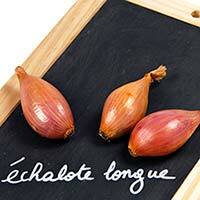 We sell a number of varieties of the traditional shallot : long (darker), semi-long and all grades. 250 g net, 500 g string, « hand peeled » in trays and 5 kg bags. We source most of our supplies in Drôme. Available in 5 kg bags only from July to October. The echalion or banana shallot is not really a shallot. 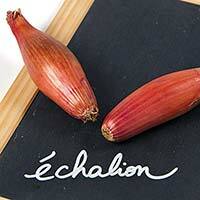 Unlike shallots, the echalion has only one, elongated bulb, and is grown from seed. We offer two sizes : large and small. Available in 5 kg bags.